I loved the green neon sweater from J.Crew that I wore last week so much that I went and got it in grey! I love the fit and feel of these sweaters. I also love this one and it is on sale! I love the colors it comes in and that it is a v neck! Yes, I have been planning my outfits around this Rebecca Minkoff bag. It is actually surprising how much mint goes with! 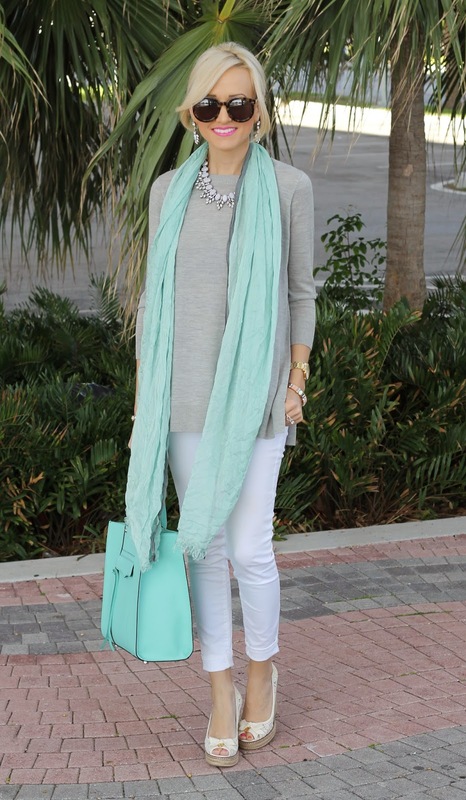 So I was so excited to get this mint scarf from Subtle Luxury since it is perfect for spring and it goes perfectly with my bag! It is really light weight and super soft! I have a great discount code for you guys today! DeChic Boutique is offering all Spoonful of Style readers 20% off your entire purchase! I have worn this necklace and earring combo everyday since I got them. I am obsessed! The color goes with everything and since I have been wearing my hair up so much it is nice to add a fun statement earring. DeChic Boutique has some really fun jewelry at really affordable prices. Use code ASPOONFULOFSTYLE20 at checkout to get 20%! Happy shopping! Love everything about this look!! That RM bag is just stunning and I love how you styled it with that amazing scarf, necklace, and those gorgeous wedges! So pretty!! 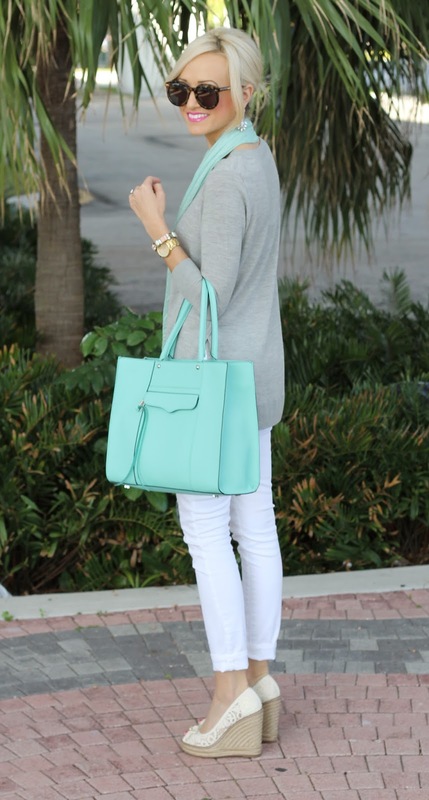 I LOVE grey and mint and i LOVE that bag yet again! Wow the soft colors are so perfect in this outfit! Love the white with gray and touch of mint! So cute! Scarf was made for your bag! LOVE this! I'm also wanting a new pair of white jeans -- and these look perfect! Ha! I'm wearing mint today too! I guess we're on a color mindset! Surprised how well the grey and mint compliment each other! There are those gorgeous Tory Burch wedges again! Love it! omg these karen walker sunnies are the cutest things I have ever seen. Your rocking them to death. Love this outfit! That bag is amazing! 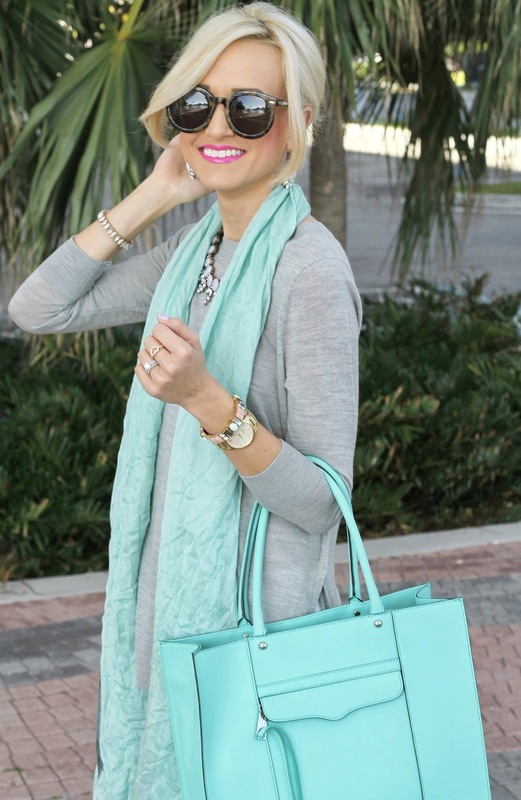 Love this color combo, especially the sweater + necklace! This outfit is gorgeous!!! Love the wedges too! I'm loving the gray and mint together. I adore grey and mint, actually just painted my bedroom those colors! You look super cute and I really like your shoes, the snake print pulls the whole look together! I love the mint! Did you get the ankle or regular length white jeans? Love your mint bag and your look. I loved all the colors but ended up getting the bright pink!